in Bengali recipe, Summer recipes, Veg. Papaya is known as "Superfood". It is full of nutrients and has loads of health benefits. It is grown very easily in tropical countries. In India, it is grown as a garden vegetable. The green or unripe papaya is eaten as a vegetable, cooked as well as raw, as a salad. Unripe or ripe papaya, both has loads of health benefits. Green or unripe papaya is an ailment for indigestion and its high fiber content helps prevent constipation. Papayas contain papain, an enzyme that helps digest proteins (especially food with gluten). The unripe papaya is considered to have more healing powers for constipation than the ripe one. The ripe papaya is known as exotic fruit. Papaya is another rich source of beta-carotene, vitamin C and fiber, and also contains potassium and Folate. In addition to aiding in digestion and thus preventing constipation, papaya also provides relief from piles and has anti-cancer properties. Papaya has also been shown to lower cholesterol levels, prevents the formation of urinary stones, prevents intestinal infection by parasites and aids in the proper functioning of the body’s immune system. For lactating mothers, according to traditional beliefs, papaya also helps to stimulate milk production. Papayas are a good source of fiber. Its fiber is able to keep cancer-causing toxins in the colon away from the healthy colon cells. Those who are experiencing constipation or at risk of colon cancer should consider taking more papaya. Papaya’s Folate, vitamin C, vitamin A, beta-carotene and vitamin E have been linked with reduced risk of colon cancer. The antioxidant nutrients found in papaya have also been proven to reduce muscle inflammation and the healing of burns and wounds. In Bengal, during summer, in many households( at least in our household), it is must to have 2-3 chunks of cooked green papaya as a starter with rice before eating anything. It helps in digestion during the hot days of summer. 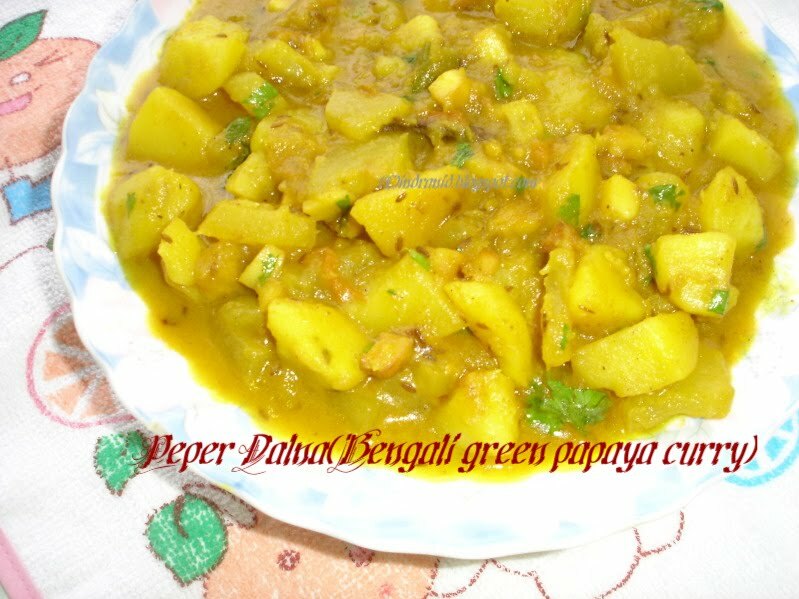 I'll share a simple but mouth watering traditional bengali recipe of green papaya curry, known as "Peper Dalna"
I need to show you one amazing thing that I have never seen before. Have you ever seen a seedless(even one single seed) papaya..Here is one for you..with that I've made this curry, but I was just amazed after cutting it into half that there was not even one single seed. Amazing, isn't it? Cumin seed powder : 2 tsp. Peel the potatoes and cut into small cube like pieces. Peel papaya and cut into thin slices. Add a pinch of salt to both potato and papaya pieces. Keep aside. Take fresh coconut flesh, peel the hard brown skin, then cut into small pieces. Keep aside. Heat oil in a pan, fry coconut pieces until they are very lightly browned. In the same oil, fry potato and papaya pieces together until brown. Take out o and keep aside. In the same oil, add bay leaves and cumin seeds. When seeds start to crackle and change colour, add grated ginger, slitted green chillies and tomatoes. Stir for 1 to 2 minutes until tomatoes get pulpy. Then add turmeric, cumin, coriander and red chilli powder, mixed with 2 tblsp. of water. In medium flame, stir to mix the spices well until oil seperates. Then add fried potato and papaya pieces. Add salt and sugar. Coat veggies well with spices. Add 1 cup or enough water to cook the veggies. It is a semi dry gravy dishes, so add water accordingly, if needed add more. Add fried coconut pieces now. When veggies are cooked, check the seasoning. When you have desired amount of gravy, sprinkle ghee and garam masala powder over the gravy. Mix well and remove from heat. Garnish with fresh coriander leaves if you want. Serve hot with plain rice. Labels: Bengali recipe, Summer recipes, Veg. Looks very yummy!! I love this curry!! Sent my recipe entry to your event..Hope you have recived it..
We make similar kind of curry with green papaya in south. Like this recipe, looks delicious. I tried this for my Bengali husband, the raw papaya took forever to cook, way past the potatoes. I then checked with my MIL, she said after the point when she mixes the masala and adds the veggies, she pressure cooks them! I kept adding water multiple times and this method took took long. 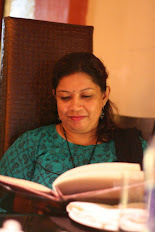 Thanks Reena for visiting my blog and trying my recipe of Peper Dalna(raw papaya Curry) for ur husband...you said, papaya took very long for you to cook. I don't know if you have noticed, in the recipe I wrote to cut the papayas in thin slices and potatoes into cubes. then I fried them with little salt added. Doing that, papaya and potatoes cook almost half and after that when you add water it doesn't take long and cooks at the same time of potatoes. You can pressure cook, but it lessens the taste a bit, I think so. Hope it helps. if you need to know anything else, can write to me.